Many professions have their own expressions and acronyms that are freely used to communicate effectively with other colleagues and industry participants. This specialized diction creates an obstacle that hinders understanding for non-industry professionals, and when asking questions feels uncomfortable or difficult, “head-nodding” often ensues, and that action outwardly implies comprehension. Unfortunately, the financial services industry not only lacks simplicity, its complexity is sometimes viewed as a quality. Nowhere is this language and understanding gap more evident than in the world of closed-end, private investments. Unfortunately, as more portfolios allocate capital to these types of vehicles in a quest to overcome predications of lower public markets returns, the barrier becomes more pervasive. Three terms that commonly get thrown around when reviewing these types of investment structures are: hurdle rate, carried interest (carry), and catch-up. This trifecta of terms is standard jargon for closed-end vehicles, but they have real world implications on the level of return investors are entitled to receive versus what they think they should receive. We’re going to use the remainder of this blog to define these terms using basic terminology and math. A private investment’s hurdle rate is the minimum return (net of fees) that a limited partner (investor) in a fund is entitled to earn from the fund (assuming a European waterfall structure – a subject for a separate blog) before the general partner begins to share in the profits of the fund. This is also often referred to as a “preferred return” but it means the same thing (more jargon). If a fund has a hurdle rate of 8.0%, but the fund only returns 7.0% net of fees, the general partner does not share in the profits of the fund and the limited partner earns the entire 7.0% (Figure 1*). 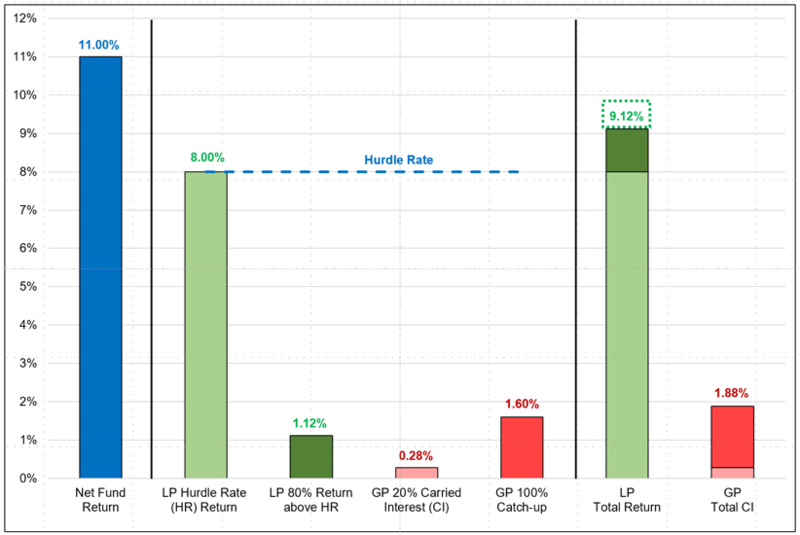 A fund’s hurdle rate is actually a “feature” of the fund that benefits the limited partners and it is always readily visible in the pitchbook summary of the fund’s terms. In a practical sense, the general partner is highly incentivized to share in the underlying profits of a fund’s success, but the higher the hurdle rate, the more capital that must be returned to limited partners before the general partner starts taking a share of the fund’s profits. The general partner’s share (percentage) of the fund’s earnings, once the hurdle rate is earned by the limited partners, is called the general partner’s carried interest or just carry for short. Carry is stated as a percentage or a split of excess earnings, and much like the fund’s hurdle rate, it is usually prominently displayed in a pitchbook summary of the fund’s terms. Using a basic example, a fund that posts a net return of 11.0% over its life that has an 8.0% hurdle rate and 20% carried interest would provide a total return to limited partners of 10.4% (Figure 2*). This 2.4% is calculated as 80% of the excess 3.0% of fund return over and above the 8.0% hurdle rate already received by the limited partners. 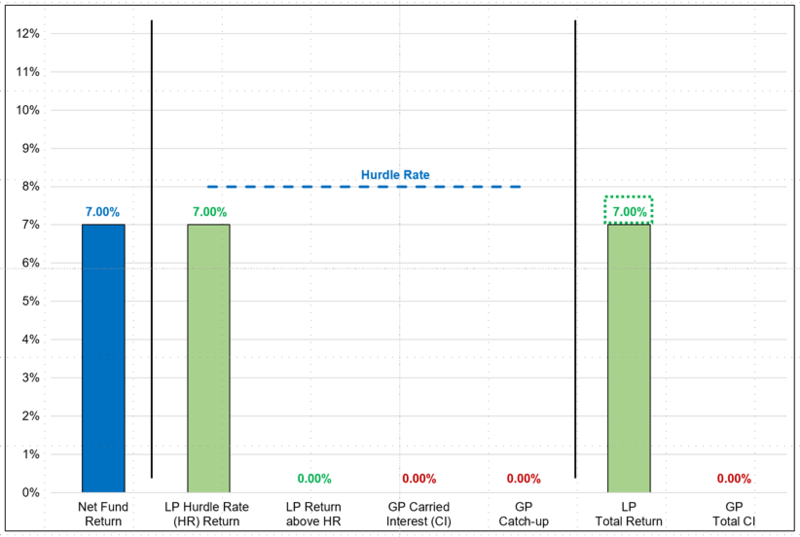 The general partner’s share of the excess 3.0% return over the 8.0% hurdle rate is 0.6% or 20%. Makes perfect sense, right? Now the head nodding part. It’s not always that simple. Most closed-end, private investments also have what is called a catch-up provision as part of their investment structure. A catch-up provision is not typically a stated fund feature since it solely benefits the general partner, and as a result, it may not be visibly listed in the pitchbook summary of the fund’s terms. It’s not that the general partner is hiding the catch-up provision, it’s clearly outlined in the fund’s offering documents, and if asked, the catch-up provision will certainly be reviewed. However, the catch-up provision is not something likely to be reviewed with limited partners in a pitchbook unless the fund doesn’t have one. The catch-up provision (stated as a percentage) represents the general partner’s ability to earn their carry not only on the excess return over the hurdle rate but also on the hurdle rate itself before the limited partners receive any additional return. This explanation, while factual, doesn’t sufficiently explain the provision so an additional example will probably help. 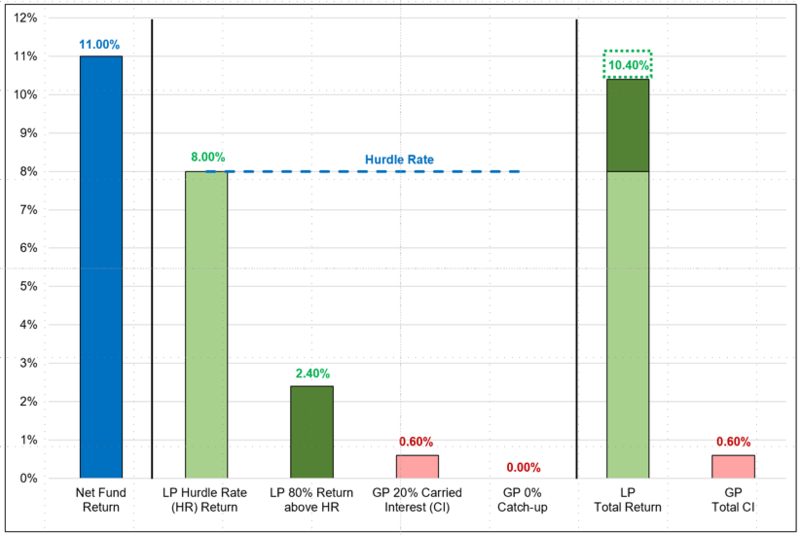 Going back to our previous example, a fund that posts a net return of 11.0% over its life that has an 8.0% hurdle rate, 20% carried interest, and a 100% catch up provision (not always but very common) would provide a total return to limited partners of 9.12% (Figure 3*). This is quite a haircut from the 10.4% return on the example that did not have a catch-up provision stated as part of its investment structure. This 9.12% return is made up of an 8.0% hurdle rate plus another 1.12%. This 1.12% is calculated as 80% of the 1.4% (not 3.0%) of net fund return over and above the limited partner’s 8.0% and the general partner’s catch-up provision. What happened to the remaining 1.6%? Because the general partner had a 100% catch-up provision, they were entitled to 100% of the excess return above the hurdle rate of 8.0% until they received 20% carry (or 1.6%) on the first 8.0% return already paid to the limited partners. This means the 1.6% of excess return between 8.0% and 9.6% was earned solely by the general partner as “catch-up” carry. The limited partners do not receive any additional return over their 8.0% hurdle rate unless and until the fund’s total return exceeds 9.6% at which point, they begin earning their 80% split of additional excess returns. As a result, even though the fund earned 11.0% net of fees, there was only 1.4% of excess return to split above the hurdle rate and the general partner’s catch-up provision, resulting in the previously stated total return of 9.12% (8.0% + 1.12%). This also means the general partner earns carried interest of 1.88% (1.6% + 0.28%) on the fund in this example. These examples barely scratch the surface of the complexities associated with many private vehicle structures but hopefully these brief descriptions of some common terms help clarify some of these concepts and the math behind them. At a minimum, it should prove the old adage that the only bad question is the one you don’t ask. Challenge yourself to avoid being a “head-nodder”. *The above charts represent hypothetical scenarios, which are for illustrative purposes only, and whereby actual outcomes could differ from those presented. Certain information is based on sources and data believed to be reliable, but AndCo cannot guarantee the accuracy, adequacy or completeness of the information.